If you’re an anime fan, chances are, you’re extremely worried about the folks at Studio Ghibli. They’re all getting up there, especially Hayao Miyazaki. Fear not, though, for there is still good anime out there in the Ghibli tradition that is spreading its wings and flying. 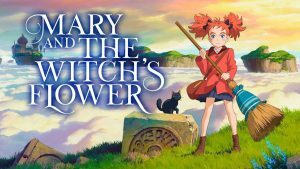 In particular, we’ve got Mary and the Witch’s Flower (2017), the first feature-length offering from Studio Ponoc. 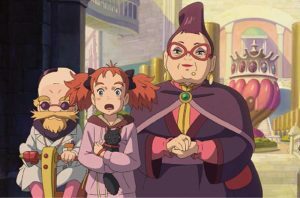 The film features the titular Mary (voiced by Ruby Barnhill), a non-magical girl, exploring a school for witches amidst intrigue. Here are five reasons to watch it this weekend. This studio comes to us as a legacy from Studio Ghibli. Studio Ponoc was founded by Yoshiaki Nishimura, a veteran of Ghibli. Nishimura worked on several high-profile Ghibli features, including Howl’s Moving Castle (2004). The same level of attention to detail is most definitely there, and the characters have that distinct Ghibli feel in their artistic conception/execution. Plus, as an added layer of depth: ponoc means “midnight,” which is the close of one day and the dawn of a new. That’s a cool legacy. A cute little story about a girl who wants to be a witch and finds a loophole in the form of a plant that grants her powers? Yes please. Throw in a school marm with ulterior motives and some wild creatures hanging around the school, and you’ve got instant coolness. I mean, come on – what’s not to love with concepts like that? As an added bonus, the children characters are very much children and not tiny adults, which helps you get back to being a little kid again. That’s always a good feeling. Much like Ghibli’s themes, Ponoc’s shaping up to cover what it means to be a little kid. Part of that is disliking things beyond your control, like where you live and your appearance. In particular, Mary dislikes her red hair – it’s a source of teasing, and she’s self-conscious about it. However, in true feel-good fashion, she’s encouraged to both be herself and find self-acceptance before becoming part of a whole. That’s a nice message right there, and one that the kids of any age can appreciate. Good lord these people know their colors. The richness of Mary’s hair is matched only by the brightness of her eyes. Wait, I’m wrong – that’s the blue glow of the flower. No, wait – it’s the luscious orange of the fire. I could keep going. The colors are so crisp and lovely that you’ll fall in love with the team for creating something so pretty. That’s a quality that lacks in most animated films, which seem focused on the prettiness of a princess rather than the gorgeousness of the environment. Seriously, the spice could flow with these colours. I won’t ruin them by spoiling them here. I ruin enough for you good people on a weekly basis. I will leave you to discover them yourself. What I will say, though, is that these lines will catch you off guard in the best way. The film has some wisdom and wry observations that will make you smile. Indulge yourself. Mary and the Witch’s Flower is available for streaming on Netflix.